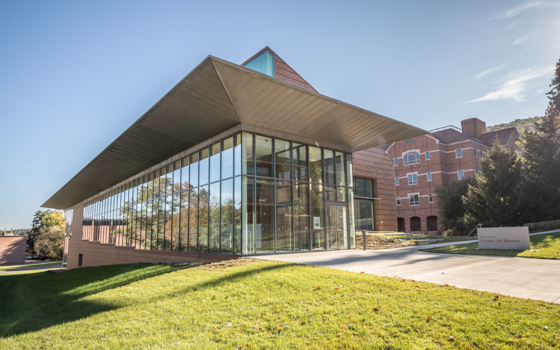 The Alfred Ceramic Art Museum, built with a gift from Marlin Miller, Jr., ’54, HD ’89, creates a signature building for the arts on the Alfred University campus. Located on Pine Street at the site of the old Davis Gym, the brick building with its sweeping expanses of glass and dramatic roof lines echoes the lines of the Miller Performing Arts Center and the Miller Theater, also designed by Architect Bruce Wood of Kallmann McKinnell and Wood Architects, Boston. The 20,000-square foot, two-story building features a 4,000-square-foot main gallery on the upper floor, accessible from Pine Street. On the lower level is the collection storage and management areas, seminar/classroom, and restrooms. The Museum of Ceramic Art at Alfred was created in the late 1980s to bring together a number of collections owned by the University and the New York State College of Ceramic Art at Alfred. Originally located on the fifth floor of Harder Hall, the museum was moved to temporary quarters in the Ceramic Corridor Innovation Center, and then to Binns-Merrill Hall before finally moving into its more spacious and more accessible new building. You can find more information about the museum on the Alfred Ceramic Art Museum site.